The pattern of arrival is similar each year, with a small number seen around 14th September followed by maximum numbers in the middle of October. The actual arrival dates and the maximum numbers seen is dependent on the weather and the availability of food. The birds will wait for a favourable weather system to assist their flight from the North West arctic regions. If they are "blocked" by adverse weather, then they may arrive later and in greater numbers. If there is plenty of food available (grain, grass and potatoes) then they will remain in the area for longer leading to a build-up of numbers. It has been found that pinkfeet have large feeding areas - from 21-69 sqKm, although they have a core area which they visit more often. Eventually, they will continue their migration to Morecombe Bay and The Wash and the numbers on the Basin will fall to only a few thousand in December and January. The return to the arctic breeding grounds happens imperceptively with counts fading away during February and March to leave only a few birds which might stay all summer. These are weak or injured birds that cannot make the migration flight. Highest number for each year in BOLD. 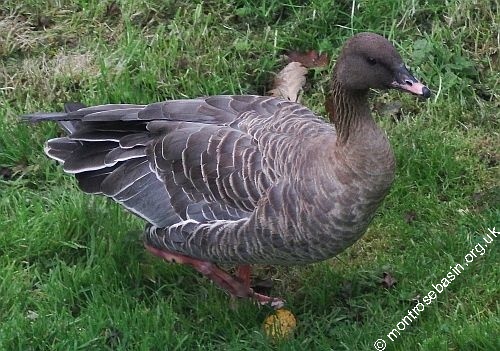 It has been found that some of the non-breeding pinkfeet fly from Iceland to Greenland to moult, while the others stay and moult in Iceland. It is thought that the greater availability and quality of grass available in Greenland makes the effort of flying 1,200Km worthwhile. The best place to to see the large flocks of geese is from the viewing blind at Tayock. While there may be some on the Basin during daytime, the best times are at first light when the roosting birds take off (en masse if you are lucky) or at sunset when they flock in to roost overnight. These are the largest count for each month. Numbers in Bold are the yearly maximum.